Cynthia E. Fletcher, 91, of Weston, Ohio passed away Thursday January 17, 2019. She was born November 4, 1927 in Elgin, Pennsylvania to Clifford and Ethel (Walker) McCray. She married Stanley Fletcher March 13, 1946 and they later divorced. She then married Albert Fletcher August 11, 1963 and he preceded her in death. Cynthia was a member of First Christian Church in Bowling Green and Order of the Eastern Star Chapter 159 in Bowling Green. She is survived by her children James (Carla) Fletcher of McClure, Ohio, Perry (Anita) Fletcher of Bowling Green, Ohio and Coleen (Fred) Bobel of Bowling Green, Ohio, brother Douglas (James) McCray of Bowling Green, Ohio, 8 grandchildren, 9 great-grandchildren and 9 step-children. Along with her husband Albert, she was preceded in death by her brother Roger McCray. Her funeral service will be held on Tuesday January 22, 2019 at 11:00 a.m. at Dunn Funeral Home, located in the Historical District of Bowling Green at 408 W. Wooster St. Pastor Matt Every will officiate. Interment will follow at Weston Cemetery. 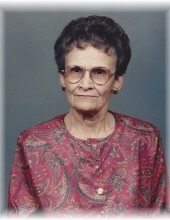 Memorial contributions may be given in her memory to First Christian Church, 875 Haskins Rd. Bowling Green, Ohio 43402. To send flowers or a remembrance gift to the family of Cynthia E. Fletcher, please visit our Tribute Store. "Email Address" would like to share the life celebration of Cynthia E. Fletcher. Click on the "link" to go to share a favorite memory or leave a condolence message for the family.